underwhelmer.com is my little corner of the inter-webs where I let funny things spill out of my skull. These funny things are often accompanied by exquisite drawings, which are also funny. These drawings may be purchased by you for a ridiculously high price so that I may continue with my Beluga caviar and Faberge egg addiction. Thanks for stopping by. You, sir, are absolutely hilarious. Thanks. 🙂 I do what I can. Can’t believe I haven’t commented on your About page yet. Just want to reaffirm that you, sir, are awesome, and I am envious of your humor-leaking skull. You should actually make some of those pictures available for purchase. I’d bite, seeing as how I’m trying to surround myself with blog-related paraphernalia for the purpose of inspiration. I really want to do that, but with my current job and my shadowy puppet masters, I can’t do anything for profit at the moment. The next couple of months will be a different matter though! How in the HECK have I never seen this blog before!? Subscribing now! Thanks. Glad to have you on board! Well that’s just awesome! Loved the post on Freshly Pressed! Hilarious, keep it up. I do my best to make the LOLz. Thanks for stopping by. Thanks. I’m really partial to the ninja kicking and leaving a rainbow trail behind him. Just found your very entertaining blog and feel compelled to tell you that I studied the Ninja Rainbow for a little while before I recognized the black area as a flying kick. I put some effort into it, figured it out, got that “a-HA!” flood of opiates and am now afterglowing. So much more rewarding than those Magic Eye migraine-inducers of the early 90’s. I look forward to poring through the rest of your blog. Ha ha! It’s good to see that at least one person gets it! Thank you. I do what I can to spread the funny. BTW ~ I’m a huge Matthew & Suzy Ward fan & follow them on MatthewBooks. com as well as others via GalacticChannelings. com and SteveBeckow. com. Love & LIGHT funny Earthling! Wow, this is quite the globe-trotting little blog I’ve put together. Thank you so much. Greetings from Germany! The only thing better than the posts are the … mouse and keyboard MS PAINT works of art ! I know that humans told you already how funny and cool you are but I’ll tell you again: you are awesome! I laugh from the bottom of my… my soul! I really love your sense of humor, your style in writing, and your MSPaint art, you remind me of… me. I am happy that I found your blog – I saw your post “What to Do if You’re the First Human to Make Contact with Aliens” in the freshly pressed. Too bad I’m no active blogger to find a post by me there. Keep it up! P.S: Check out my blog if you want, even if I mostly use french to write – it’s my main language. Have you submitted stuff to Cracked.com? You have a gift for funny and perhaps owe it to the world to share that gift harder. Subscribed!!!! Nerds are hot….just sayin. Wow, thanks! I don’t know why all you guys like my crappy drawings so much, but I won’t question it. My trophy shelf is looking fairly posh now! 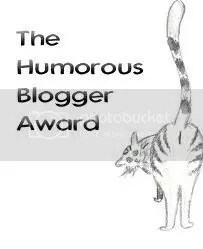 I am passing along the Humorous Blogger Award to you. I have created a permanent page for this award. Please reference the link for the rules. This is a special award. It is not your standard “list seven things about yourself” award. Instead it provides an opportunity to share your relationship with humor. Real knee-tapper, this blog. I couldn’t help but notice… Is that a typo on the blog banner bio “Making life better though the perfect application of humor and nerdery”? I run spellcheck for free. No charge. Legal tender tips are entirely welcome. Well spotted. I think you’re the first person to notice. Please don’t tell anybody else, but “nerdery” isn’t a word either. 😉 I’m breaking the rules all over the place. I stole the word “nerdery” from here. Please don’t tell the cops. FYI – Your art pieces have me in real stitches. Hi I just wanted to say thank you for the versatile blogger award. im a bit star struck, i love your blog!!! You always manage to give me a chuckle. I’m jealous that you find the time to update everyday. I can barely manage once a week. You absolutely tickle me. Thanks for the laugh. Stop by every week for more funnies. I absolutely love your blog! I just nominated you for the Versatile Blogger award :). Thanks for all the laughs from your posts! 2. Share 7 personal things about yourself. 3. Pass this award along to 5-15 recently discovered blogs you enjoy reading. I’m moving, but when I get settled you can expect to see one. You’ve you been nominated for the inspirational blogger award! 😀 The instructions for accepting it are on my wall. I’ll have to make my way over soon. I’m glad you like my little blog. I LOVE your little blog. Hehe. I nominated you for the ABC Award! Visit http://insearchofthesilverlining.wordpress.com/2012/04/05/this-blog-is-friggin-awesome/ at your convenience and keep up the awesome work! Greetings! Just letting you know that I’ve nominated you for the Kreativ Blogger Award because I have enjoyed reading your blog and the entertainment it has provided. If you wish to accept you must follow a few simple rules, thank the blogger who has nominated you, tell your readers about you and pass on the honor to some of your favorite bloggers. The award won’t make you rich or famous, in fact it means nothing more than someone appreciates your writing, but it is the thought that counts. I just came across your blog from Allie’s Pro Tip blog, and I gotta say it’s hilarious! Congrats, you have a new follower! dear interesting human, i wish to add to your collection of digital trophies. please keep up the hilarious (and very informative) blogging. Yes! Maybe one day I could be an interesting specimen for your cruel overlords. Laugh out loud funny – thank you – I always need that. Only saying how you made me laugh and complimenting your funny art(funny art, funart, fart!! ), isn’t enough. I keep coming back and want you to write more is. I just read your entire blog….entirely…something I rarely do. Hilarious! You should put a warning label, however, on your header: Do not consume hot beverages while reading the following as your hot beverage may come out of your nose. Seriously. Hot tea out the nose is not fun, but your illustrations are. Fun, that is. Illustrations shouldn’t come out your nose. So Funny! 🙂 Looking forward to following your humor. LOVE IT, BUT A PLAYA IS BROKE UNTIL THE FIRST. I CAN’T BALL OUT OF CONTROL YET. I HAVE MY SECOND JOB INTERVIEW TOMORROW. CAN’T WAIT!! One question. What is a faberge egg? I’m sure your answer will be more enlightening than googles’. Virtual high five to you brother, your blog is hi-larious.